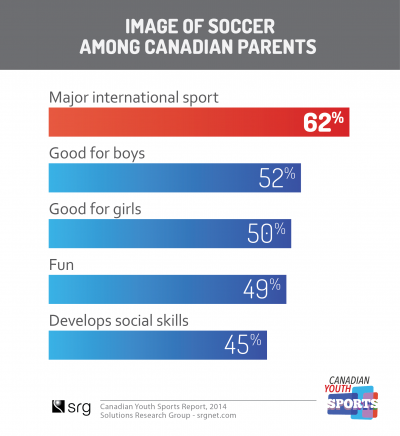 84% of Canadian youth in the 3-17 age range participate in sports of some kind and 60% do it on an organized basis according to the Canadian Youth Sports Report being released today. The levels of competition on the fields, the dojos, the gyms and in the arenas have never been more intense – and so is the competition among sports and activities themselves for the ever-limited time – and money – of Canadian families. Canadian Youth Sports Report is the most comprehensive study ever undertaken on the challenges and opportunities facing Canadian kids and their families when it comes to the sports they play. 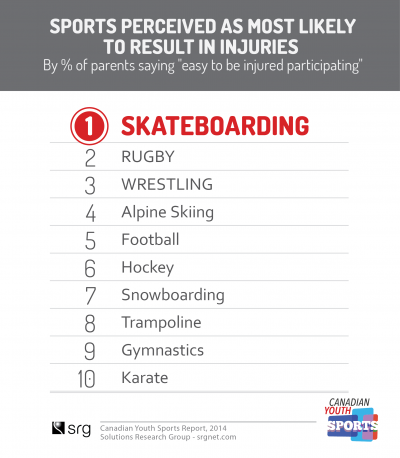 This landmark study by Toronto’s Solutions Research Group is a deep dive into 44 sports and physical activities that Canadian kids love, based on interviews with 2,371 families. Youth sports represent a $5.7 billion market with families spending nearly $1,000 annually per child on sports. 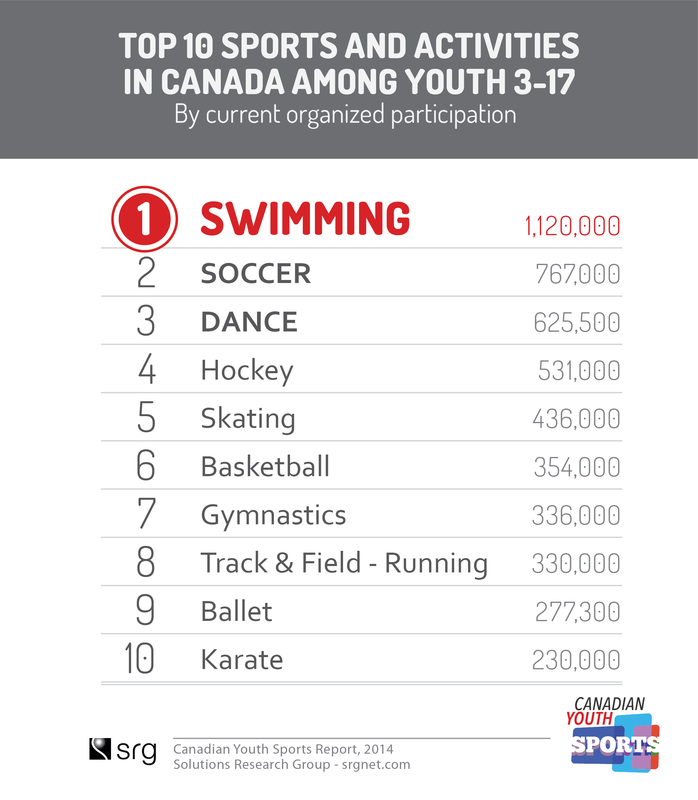 Over 1.1 million Canadian kids and youth (19% of all 3-17 year olds) are currently in swimming lessons, instruction or competition. Soccer was next, with over three-quarters of a million current organized participants in the 3-17 age group, making it the top team sport in Canada. Soccer was the top team sport for kids 3-6, tweens 7-12 and teens 13-17, as well as for boys and girls. It was also the top team sport for all regions: BC, The Prairies, Ontario, Quebec and Atlantic Canada. Girls are more likely to be in individual sports, according to the research. And, a popular physical activity like Dance is a big factor, drawing large numbers. 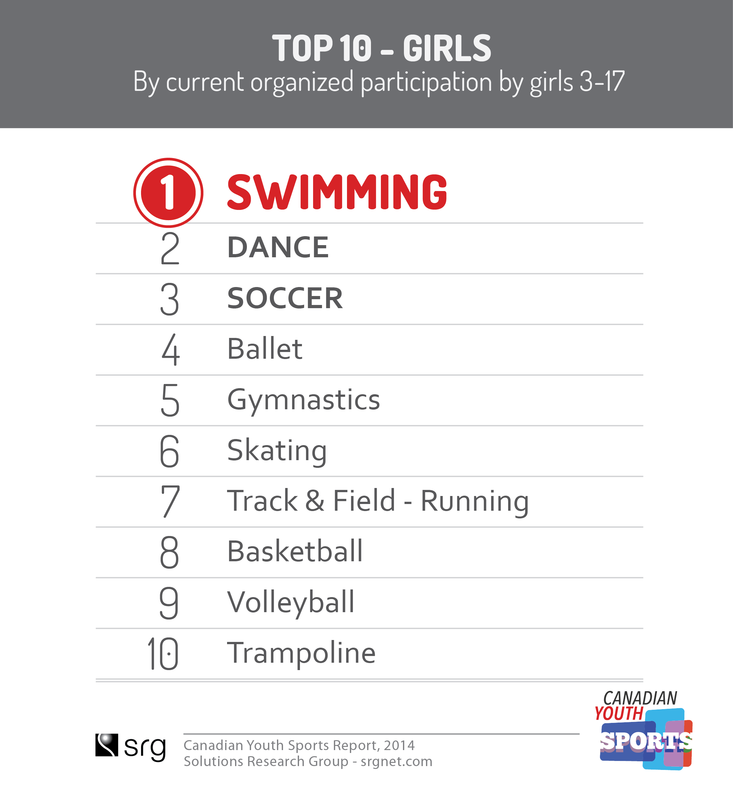 In fact, there are more girls in the 3-17 age range registered in organized dance, ballet and gymnastics (24% of all girls) in Canada than girls participating in all team sports combined (22%). New Canadian families, where the parents were born outside of Canada, value sports too, but they also put priority on participation in music, art, book clubs, language learning. Fifty-five percent of new Canadian youth aged 3-17 participate in organized sports but they are slightly less likely to be in organized team sports (24% vs. 30% average). Top team sports for New Canadian youth were soccer, basketball, hockey and volleyball, in that order. With over one million immigrants settling in Canada every four years, establishing a strong base among New Canadians is essential to the future growth of any sport in the country. The study found big differences in participation cost for the 44 sports examined – ranging from an average of just about $200 per year to over $2,000 per year, per child. Popular team sports such as basketball, volleyball and soccer cost 25% to 50% less than the average, while hockey came in as the second most expensive of all 44 sports studied. The top three most expensive sports to participate for youth based on reported average annual spending were Water Skiing ($2,028), Hockey ($1,666) and Equestrian ($1,434). At the other end of the spectrum, most affordable options were Track & Field ($226) and Cycling ($237). The range of costs and options available to families is very diverse. When reporting annual participation costs for organized participation, parents were asked to include expenditures on equipment and sport-specific gear, any fees for leagues, teams or lessons as well as direct travel/transportation costs. At the more competitive, organized levels of many youth sports, with travelling teams and participation in away tournaments, parents told us that travel and hotel costs are significant in open-ended comments. The image of each sport in the minds of parents play an important role when deciding which activity is right for their children, especially if parents have not been involved with the sport before. Parents worry about the level of exercise their kids are getting and also fret about injuries. One-in-five youth (about 1.2 million) has experienced an injury in the last year and two-in-three parents are concerned about possibility of serious injuries in the future. 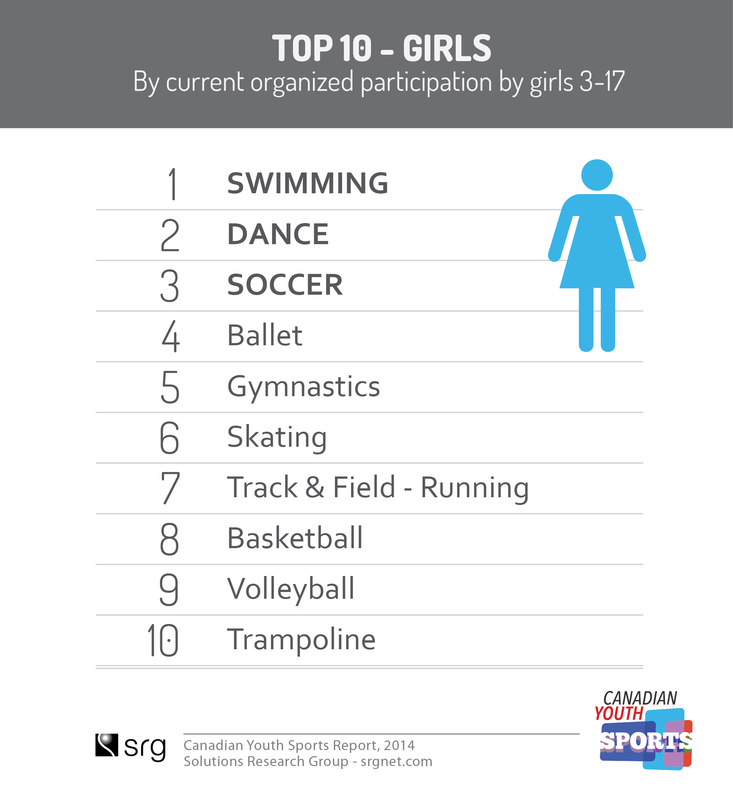 Half of boys’ injuries came from soccer, hockey or football while the top three for girls was soccer, gymnastics and dance. Top soccer injuries tended to be ankle injuries and sprains, hockey injuries tended to be broken bones/fractures and concussions – and there is also a growing fear of the longer term effects of sports concussions among Canadian parents. The research found that there are 21 sports and activities (team & individual) with at least 100,000 organized participants in the 3-17 age group in Canada and another 23 with estimated participation of 25,000 to 100,000 – with this many options, growth is a challenge for all sports. Canadian parents also recognize the work done by various companies who have associated themselves with youth sports, with Tim Horton’s, Canadian Tire, and BMO as top mentions. Thirty-two percent (32%) of Canadian kids and youth follow the NHL, ranked #1 in all youth demographics. The NBA is in the #2 spot in Toronto, Vancouver and among New Canadian youth. MLS ranks #3 in Vancouver and #2 in Montreal. The research suggests that youth engagement with professional leagues is an area of concern, however: even among teens 13-17, 43% do not follow any professional league. Canadian Youth Sports Report is an independent syndicated study published by Solutions Research Group (SRG).